Practice MOD - WOMEN ONLY!!!!!!!! 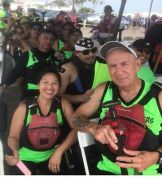 Dragon Boat racing is the fastest growing water sport in the world with races held all over Asia, Europe, Australia, and America. With over 100 countries and more than 50 million paddlers competing and having a great time, Dragon Boating will continue to grow as a local sport as well as a global sport. Now you get the chance to discover why these paddlers are so dedicated in this highly cultural sport, that teaches the importance of team work, unity, and self discipline. In addition to learning how to paddle, you'll get a great cardio workout at the same time having fun doing it and meeting new people. Regular practice time is from 7:30 AM to 930 AM on Sundays at Mother's Beach in Long Beach. A few Saturday practices are also available. Normal attire includes board shorts, rash guard or tank top (depending on the weather) and optional water shoes. Please bring a water bottle. You will get thirsty! "Adventure­ Backpacking Camping Daytrips & Hiking Outside LA"